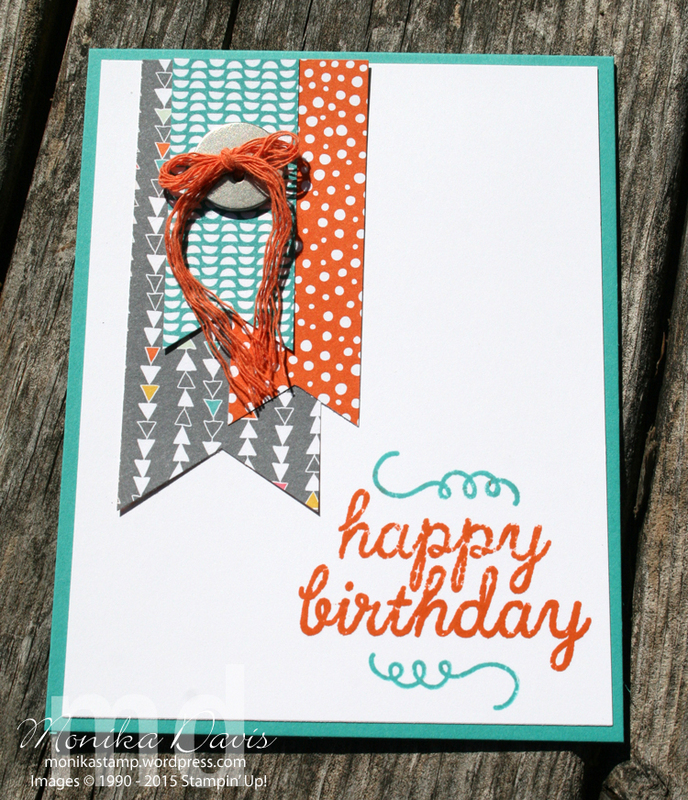 The happy birthday stamp with the swirls is from the May Paper Pumpkin kit. 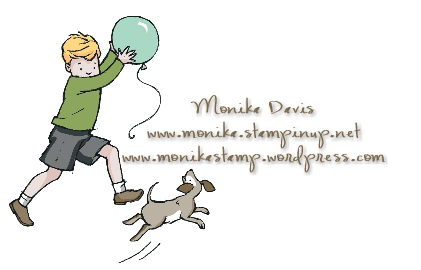 Plus I used ink spots from some earlier kits – Bermuda Bay and Tangerine Tango to ink the stamp – little spots are easy to use for inking just a portion of the image in one color and the rest of the image in another color. The big ink pads you can’t really do that with – you could however use the Stampin’ Write Markers to do this but sometime I think the ink pads give better coverage of ink. The Tangerine Twine in the button is also from what comes in the kit – I just separated the twisted twine and used some of the Tangerine threads to go through the silver metal button. It’s also the same twine we had in the Holiday catalog and in the carryover section of the Occasions catalog – so you can order more of it through June 2nd. I also used some of the retiring designer paper – this pack is called Confetti Celebration – which is bright with geometric patterns in it. 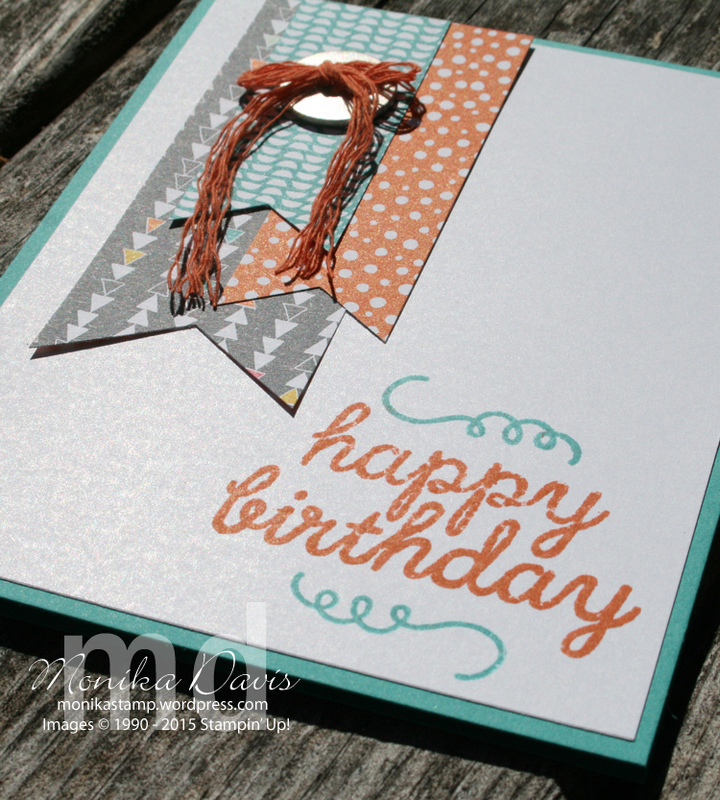 I do have another sneak peek item that I used on this card!! I bet you can’t guess what it is. It’s a brand new PUNCH coming in the new catalog and I think it’s going to be a top seller! I’ve already been using it like crazy – it’s the new Banner Triple Punch – and it punches the little banner tails for you and has guides for 3 different widths of paper – 1″, 1-1/2″ and 2″. Plus I found that I was still able to use it outside of the guides for other widths of paper – i just flipped it over so I could see where it was punching the tails underneath. This punch will be available June 2nd! Offer Details: Use the code SAVE50 to join Paper Pumpkin before June 10, 2015, and get 50% off the first two months! After that, keep the creativity coming for only $19.95 + tax per month (shipping included). It’s for new subscribers on a month-to-month subscription. Click here for more info and to join. I hope you liked that alternate card idea. This entry was posted in Birthday, Cards, Designer Series Paper, Paper Pumpkin and tagged Monika Davis, Paper Pumpkin, Stampin' Up!. Bookmark the permalink.